In a far distant land, where magic flows, three peoplekinds face their troubles together. Peregrine wishes he could set Tillian free. But he is an aging dragon deafened by his mining career – he still needs his keen-eared adoptive daughter to relay the world to him. Their two lives are knotted together by love, custom and Peregrine’s self-induced weakness. When a dreaded plague menaces the land, Peregrine has no more time to delay his choice. He must fly for supplies on his weakened wings, while Tillian nurses critically ill strangers. Separated for the first time in Tillian’s life, they will work for the same cause: saving the young mage Rose and her dying village. In light of this mission of mercy, Peregrine decides to leave his selfish ways behind – which means leaving Tillian, whether she wants to live for herself or not. 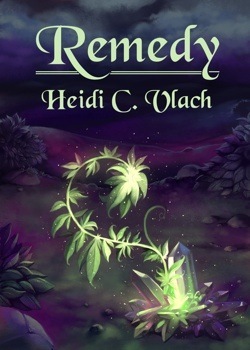 Remedy is a book that ambitiously explores what it means to be family. Not just the families that share our blood but to the people we choose to bring into our lives, the communities we make our homes in and our world at large. The result is a refreshingly positive vision that rejects the current trend towards dystopian themes. If the story is lacking in the backstabbing machinations so prevalent in fantasy today it more then makes up for it in the strength and courage of it’s unique characters. The writing is lush and descriptions are often ripe with scent and flavour metaphors. The descriptions of the non-human characters make it is easy to visualize how they move and interact. Throughout, the characters swap myths and stories about their world and because of the magical nature of their realm these can seem to be either allegorical teaching stories, true tales of fantastical magic and heroism or a blending of these. The mythology and world building is cohesive and gives the story a rich and interesting foundation on which to be told. Personally I was delighted to find that there is supplemental material on the races, myths and origins of Aligare available on the Author’s website. Ultimately what made me love Remedy so much was its optimism. Because of its reliance on outside conflict rather than character conflict this is the kind of book that only exists in the new world of self publishing. It is a prime example of how our reading lives will be enriched by access to books that don’t fit the established publishing paradigm especially now that the industry seems to be taking less and less risks. Ms. Vlach has created a world where the people strive to do their best and make a better world for everyone. I don’t just want to read stories set in this world, I want to live in it.